Bacon & Baseball (aka Hog Heaven)! There are so few great combinations in history: Abbott & Costello, Tristan and Isolde, Starsky & Hutch, Wesley & Buttercup… Last night in Lehigh Valley, PA, I think I found THE perfect combination: bacon & baseball, in the form of the Lehigh Valley IronPigs! Not only was this trip a gastronomic adventure of epic proportions, it was one of the best ballparks I’ve been to so far, and every member of the staff and all the fans I met were incredible. It’s no wonder that the list of accolades for Coca-Cola Park includes “Best Fans in Minor League Baseball! and it’s not called “Bacon USA” for nothing! Before I get to the food review, I want to wet your appetite with some great game and stadium notes. From the start, I want to give a shout out and a huge thank you to the staff of the IronPigs, especially Joe Fitzhenry, Media Relations Assistant for the IronPigs. Shortly after purchasing my ticket to Saturday’s game, I emailed the team an inquired about a media pass. Joe set me up with one which allowed me to get some incredible photos. 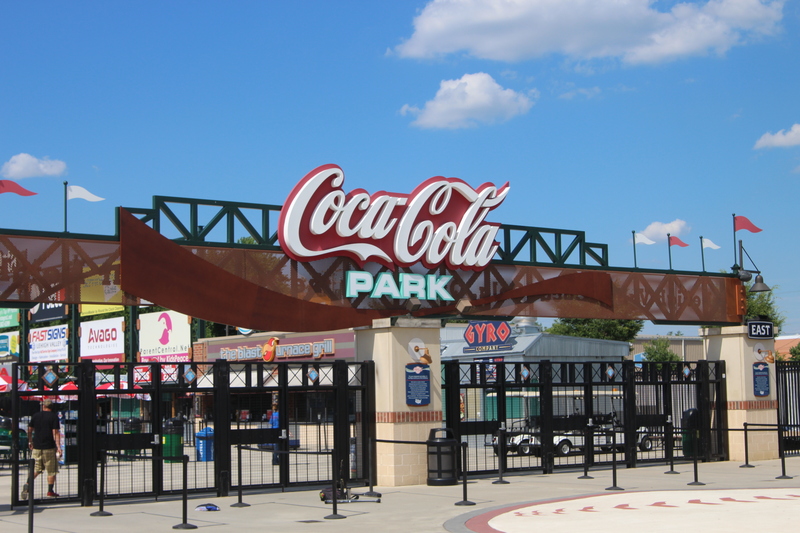 The entrance to Coca-Cola Park is quite impressive. This is no bush league field! The park opened in 2008 with an initial cost of just over $50 million. They have multiple seating options, from outfield grass seating to club level seats, suites, and party decks. Outfield seating also includes options such as the Bacon Strip, with views just over the right field fence, and the newly added Pig Pen in left field. The Pig Pen opened this year, and puts fans literally inches away from the field. They moved the outfield wall in by about ten feet, and added a group seating area between the field, now with just a six foot high wall, and the bullpens. Fans can have a chat with the visiting team’s bullpen while ordering some great food. At tonight’s game one of the groups included a large bachelorette party. The players didn’t seem to mind being so close to the fans, although I am sure being this close they are being hounded for balls and autographs during the game, something they can’t oblige in during the game. I didn’t come back to ask who won the scavenger hunt. Here’s how close you are to the bullpens! I arrived in plenty of time to catch some batting practice and infield drills, something I wasn’t able to catch when I recently visited the Harrisburg Senators. While most fans just notice bp, and hope to catch a home run if they are lucky enough to be in the ballpark early, there’s quite a bit going on at the same time. Batters hitting, fielders taking infield practice, stretching, and even agility drills to get warmed up for the game. While I was on the field, I ran into Jayson Werth of the Washington Nationals, who is playing for the Syracuse Chiefs on a rehab assignment. He met with some fans prior to the game and was signing autographs. Werth has been out since being hit on the wrist on May 16th in a game against the Padres, which resulted in two fractures. He’s coming along well in his rehab, and mentioned in a game the other night that he was batting against a pitcher who was lighting up the radar gun, but wasn’t sure of his control. I immediately thought of Nuke LaLoosh in “Bull Durham” when Crash Davis warns the batter, “I wouldn’t dig in, even I don’t know where he’s going to throw it!” His wrist didn’t seem to bother him during this game as he went 3 for 4 with a double and 2 RBI. Werth is currently hitting a cool .400 in his assignment. Before, and during, the game, I ventured up to the press box. For me, and many fans alike, this is almost sacred ground. Lehigh Valley is a AAA level farm team of the Philadelphia Phillies and their press box is truly a state of the art facility. The IronPigs broadcast all 144 games on thier flagship station ESPN 1230-1320 AM, and is the source for live play-by-play coverage of all IronPigs preseason, regular season and postseason games, including extensive pre-game and post-game coverage. Announcers are Matt Provence and Jon Schaeffer. They have two radio broadcast booths as well as a TV booth, where they stream all of their home games on the MiLB network. Provence and Schaeffer calling the action. Prior to the game I ran into the Chiefs’ announcers, Eric Gallanty and Kevin Brown. 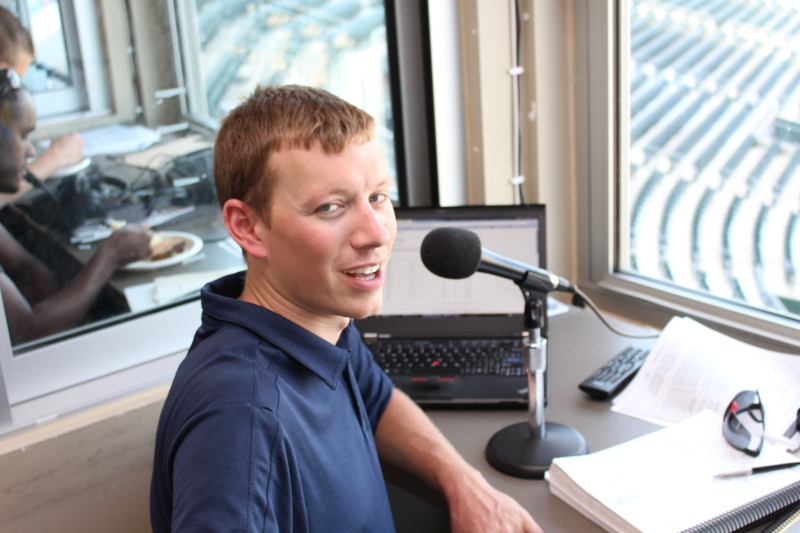 Gallanty is in his first year calling the Chiefs games, having spent last season with the Salem Red Sox in the Carolina League. Brown is in his fifth season working for the Chiefs. We chatted briefly about the grueling schedule, as well as their interaction with the players and with the big league team, the Nationals. It was a pleasure chatting with them. I wish I had a chance to chat with IronPigs’ broadcasters Provence and Schaeffer prior to the game, but I didn’t get a chance prior to the game, and I was not going to interrupt them while they were doing their job during the game! The IronPigs have an incredible multimedia production facility on the other side of the press box. Here they queue up all the scoreboard graphics, in game sound effects, and run the video board for the tv broadcasts. It’s also where the PA announcer, official scorer, and the MiLB First Pitch operators sit. Justin (Manager, Multi-Media Design and Entertainment) operates all the scoreboard graphics, while Terrence (Director, Multi-Media Design and Entertainment) runs the board for all the sound effects. During the 4th inning, young Matthew took over the PA announcing duties from IronPigs announcer Jimmy Walck. Walck provides the sizzle during the game in this bacon prevalent park. Here, Matthew is prepping for his next big announcement. Celebrating a job well done! At the start of the game, the IronPigs had quite the lineup of folks throwing out the first pitch. It was great seeing such a wide range of folks chosen for this great honor. If it were me, I’d probably bounce a 45 foot curveball to the catcher! Performing the National Anthem was David Demsey. Demsey is a Professor of Music and Coordinator of Jazz Studies at William Paterson University. He earned a doctorate at the Eastman School of Music and received a Master of Music in Saxophone from the Juilliard School. He gave quite the performance! By now I was ready to try some of the delectables offered throughout the park. But where to start? Everywhere I turned I saw bacon. And bacon! And MORE BACON!! BBQ bacon sliders, a pork parfait (featuring mashed potatoes, pulled pork topped with shredded cheese, green onions and a boatload of bacon), candied maple bacon on a stick, bacon pizza, chocolate covered bacon…. for the health conscious, they even offered broccoli, in the form of deep fried bacon cheddar broccoli bites… roasted seasoned corn on the cob… even a monstrosity in the form of a two foot long “Hawg” Dog topped with bacon, chilli, fried onions and cheese, and served on a French roll! After my small snack, I was ready to enjoy some IronPigs baseball! The IronPigs actually means two things. Being from Pennsylvania, ironpig is deived from pig iron, raw ion ore that is melted down, refined and then used to make steel. The ion was called “pig iron” because as it was melted into molds, it was said to resemble a row of piglets. The IronPigs mascots are Ferrous and Fe-Fe. Ferrous wears #26, which is the atomic number for iron! All through the night they played Christmas music between innings, and even had the Coca-Cola polar bear in attendance. The music ranged from “Santa Baby” to Twisted Sister’s version of “Oh Come All Ye Faithful.” They had some great on field activities, including a cookies and milk eating contest, as well as their pork racers during the middle of the 6th inning. At first I thought this was leftover from perhaps a recent Star Wars night. Took me a minute to realize it’s actually a video camera! By now I had worked up enough of an appetite to get more bacon. One can never have enough bacon. This time I opted for the maple bacon on a stick, and for dessert, the chocolate covered bacon! I was curious about the 2 foot long Hawg Dog, and I found some fans that enjoyed this little treat! I’d say they made a pretty good dent in it! My first experience at Coca-Cola Park was amazing. Everyone from the fans to the ushers to the front office staff were extremely friendly and helpful, and I can see why the IronPigs year after year continue to be the best drawing team in the minor leagues. Tonight’s attendance was 10,100, and I am sure every one of them had as much fun as I did! While on the way home, I passed by a White Castle. I can’t remember the last time I had White Castle, and while the spirit was willing, the flesh was full and I couldn’t bring myself to stop and get a bag for the 3.5 hour trip home. Besides, I doubt I could get them with bacon! Great blog update. You had me at bacon.